Undergraduate researcher Christine Carson presents at a poster session at Bond Life Sciences Center. Most laboratories in the Bond LSC have undergraduates as part of the research team. 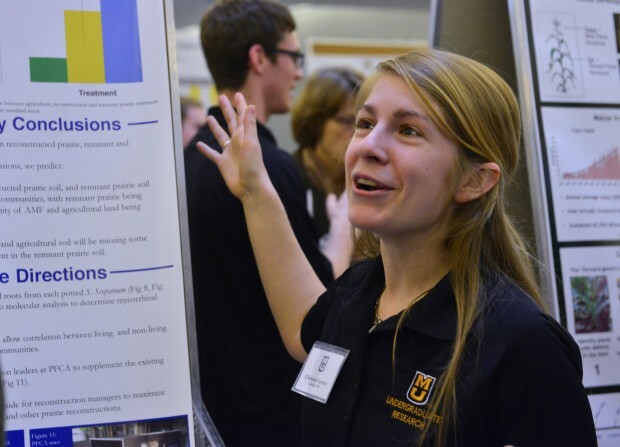 Some positions are paid and others are volunteer, but either way, undergraduate research is a tremendous opportunity. Bond LSC is home to some fantastic mentors whose students go on to take positions in industry and prestigious academic institutions in Missouri and around the world. The Office of Undergraduate Research, located at 150 Bond Life Science Center, is often able to place undergrads in lab positions that fit their interest areas. HireMizzouTigers.com also lists undergraduate opportunities on campus.